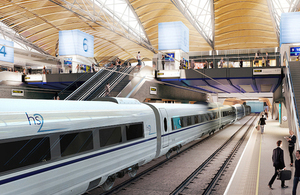 Visuals for the proposed HS2 Euston Station. TSSA general secretary Manuel Cortes has responded to rumours the HS2 project is to be cancelled by saying the UK needs more rail, not less. Channel 4’s Dispatches correspondent Liam Halligan spoke to a senior cabinet source who said the government is considering saving costs by only building HS2 to Birmingham and is ‘actively considering’ axing the entire HS2 scheme. TSSA general secretary Manuel Cortes said: “The Tories cannot be allowed to carry on robbing our country of vital future infrastructure projects because they can’t manage the economics of it and because they’ve fallen for their own spin that is about shorter journey times. “Britain simply can’t afford not to carry on building vital rail lines. Our motorways are gridlocked and our existing rail lines just don’t have the capacity to expand. So we need new rail links. Far from being suspended HS2 needs to be extended beyond Leeds and into Scotland. “This is not about shaving 10 minutes off a journey time. It is all about enabling our populations and freight to move better and swifter between our cities and curating modern 21st century transport systems. The economic planning for the rejuvenation of the North and Midlands has been based on HS2. It is deeply cynical of Minister for Transport Butchery, Chris Grayling to bury his desire to slaughter HS2 in the continual national disaster news that is Tory Brexit. “Money being used for HS2 will be not diverted to other rail projects. It will be like Crossrail all over again – we will wait for at least another 40 years before we invest in 21st Century high-speed rail.If HS2 is cancelled, even in part, that money will be lost. “In terms of connectivity, there are already plans for a new railway line between Oxford and Cambridge and for so-called ‘HS3’ in the North. These two major projects will greatly increase East/West connectivity and these should go ahead together with the electrification work that has been cancelled and investment in digital signalling systems on the east coast mainline and commuter lines into London to increase capacity.